I have a confession to make before I get to the real theme of this post. I drove about 120 miles from my home to the Golden Spike National Historic Site in northern Utah for my first time this past week with a bird photography friend and I did not even think to look for the Golden Spike that ceremoniously connected America's first transcontinental railroad in 1869. Doh! It wasn't until about an hour after leaving the area that I realized my missed opportunity. What, you might ask, would cause one to completely miss the obvious at such a location? Well, the theme of this post, of course. We had seen eBird and local listserv reports of Gray Partridge and Sharp-tailed Grouse at that location and neither one of us had seen either species before. We wanted to see and photograph them so we made the drive. We found them rather quickly as we arrived at the visitor center and got "de-railed" from the train history by the natural history of birds taking place before our eyes. The -5 degree temperature also made us eager to get back into a warm vehicle and move on to our next birding spot. I'll have to go back some day and get beyond the visitor center to the monument. Utah has about thirteen species of upland game birds. Several were actually introduced from other countries so I'll indicate that as they are introduced through this post. Gray Partridge (aka Hungarian Partridge introduced from Europe) and Sharp-tailed Grouse are seen only in the extreme northern parts of the state. Ruffed Grouse and White-tailed Ptarmigan are seen in the northeast parts of the state. I've heard (not seen) the Ruffed Grouse drumming, but I have yet to see the Ptarmigan. Consequently, both are still on my list of birds to photograph. Gunnison Sage Grouse (very similar to Greater Sage Grouse) are found in a very small range in the central part of the eastern border of Utah. This one is also on my list of birds to see and photograph. The range for Greater Sage Grouse forms a bit of an upside down U-shape around the northern half of the state. We have a lek near Henefer, Utah that is active each spring. I'm told this and others leks were established many years ago. Since that time a road has been constructed, but the birds still come to display on and around the road. It is quite a spectacle that appears and disappears within about 30 minutes right at sunrise during breeding season. Scaled Quail are seen only in the extreme southeastern part of the state. This is another species on my list to be seen and photographed. Both California and Gambel's Quail appear in the state, but their ranges do not overlap within Utah. California Quail are in the northern third of the state and Gamble's are in the southern third of the state. Images below allow you to see some of the differences between the color of the male's crown and forehead for both species. The California has a dark crown with a pale forehead. 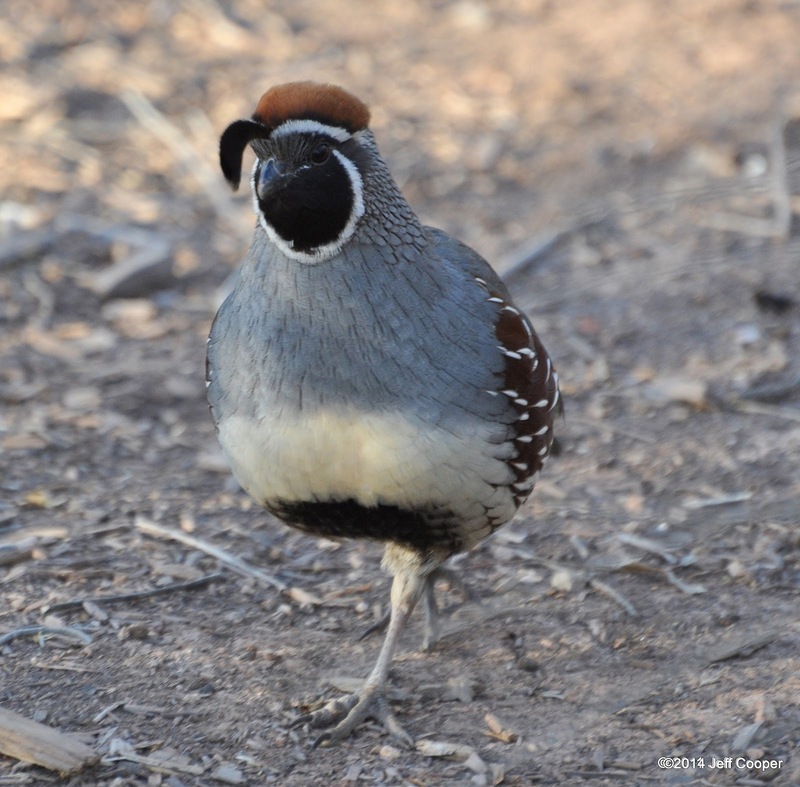 Gambel's has more of a Chestnut-colored crown and dark forehead. California also shows a scaly appearance on the chest and belly. That feature is absent with Gambel's Quail. Ring-necked Pheasant (introduced from Europe and Asia), Chukar (introduced from Middle East), Dusky Grouse, and Wild Turkey appear throughout most of the state. Look closely at the hen image below. Do you see a little something extra near her? She is a hen and it was breeding season. Amazing how tiny the little ones were. Both birds below are standing in line under a light rain. This image with them facing away. This one providing a front view. And once in a while we come across some transplants in Utah. These are usually escapees from local game farms. I grew up in Kentucky and was very familiar with the call of a Bobwhite. Imagine my surprise and excitement while standing among the sage brush in a Utah desert when I hear "bob, bob, white!" I told my friend that I just heard a Bobwhite calling. We tracked it down and got the images below. I have no idea of the origins for this strange pheasant that I discovered near Utah Lake State Park in Provo, Utah a couple of years ago. Thank you, Serkan, for visiting the site and leaving a comment. Awesome pictures and funny story! Sounds like something I would do these days! Thanks, Jonathan. I feel too young to be so oblivious sometimes. Jeff these photos are absolutely stunning. These birds have such coloration and detail in their plumage and you seem to have captured it for every single species. Truly incredible stuff! Thanks for sharing. Thanks, Laurence! I am grateful every day for digital technology that allows us to capture the images we get. Today I was photographing Bald Eagles and other birds in flight and took a moment to think of how hard that would be in "the old days" when autofocus and immediate digital feedback was not available. Thanks for commenting. Interesting post and terrific shots of upland birds! The only ones I am familiar with are the pheasant, seen in Iowa, and the Gray Partridge in Germany. In the dusk I almost missed the partridge except for its strange calls. Gorgeous pics of the Sage Grouse! Thanks, Hilke, for your kind comments.